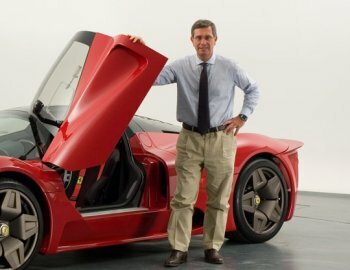 The Pininfarina family (above, Andrea Pininfarina with the Ferrari P4/5) is set to lose its voting majority as the board has proposes a 100 million euro recapitalisation. It reviewed and approved the industrial and financial growth plan developed with the advisory support of Roland Berger and Rothschild, which is designed to relaunch the Company by leveraging its excellence in manufacturing, developing a Pininfarina electric car and strengthening its balance sheet and financial position. To support the industrial plan, it agreed to carry out a contributory capital increase, which will be implemented through a rights offering that will enable eligible investors to purchase common share for a total amount of 100 million euros, including both par value and additional paid-in capital. The Pininfarina family will underwrite its pro rata share of the capital increase, exercising the rights it will receive, relying in part on the support of new investors, such as Vincent Bolloré, who has expressed an interest in such a transaction. EBITDA represent the profit or loss from operations before depreciation, amortization and additions to provisions. The result from operations is equal to EBIT before deducting extraordinary writedowns. EBIT represent the profit or loss from operations. Pursuant to of Article 154 bis, Section 2, of the Uniform Finance Code, Gianfranco Albertini, in his capacity as Corporate Accounting Documents Officer, declares that the accounting information provided in this press release is consistent with the information in the supporting documents and in the Company’s other documents and accounting records. The result from operations (loss of 33.8 million euros) also improved, compared with a loss of 43.5 million euros in 2006, reflecting the contribution of efficiency gains at the Group’s Italian production facilities. The programs implemented to increase operating efficiency and reduce fixed costs succeeded in bringing the Group back to profitability at the EBITDA level, but the benefits they produced were not large enough to offset the cost of depreciating the capital assets in which the Group invested in previous years in anticipation of substantially higher production volumes than those achieved in 2007. Moreover, the result from operations reflects the impact of a reduced contribution from gains on asset sales, which in 2007 were 7 million euros less than the previous year. EBIT were adversely affected by the need to adjust the carrying values of the Group’s assets to a level consistent with the projections of the new industrial and financial plan. Based on the results of an impairment test of loans receivable and other assets, the Company decided to recognize extraordinary writedowns to adjust downward the value of these assets, adding an extraordinary charge of 69.6 million euros to already negative EBIT. The impairment test was based on the production volumes already billed to customers and on a conservative estimate of volumes to end of contracts, compared with original investment payback projections. Net financial expense totalled 10.6 million euros, as against net financial income of 20.8 million euros in 2006. However, the amount reported in 2006 included extraordinary financial income of 22.8 million euros generated by the sale of trading securities. Net of non-recurring components, the increase in financial expenses is due to a rise in average indebtedness, the writedown of loans receivable and a reduction in interest income caused by the lower volumes generated by some production orders. The loss for the year, which includes taxes of 4.2 million euros (tax benefit of 1.7 million euros at December 31, 2006), totaled 114.9 million euros, compared with a loss of 21.9 million euros in 2006. The loss for the year accounts for most of the reduction in shareholders’ equity, which decreased by 116.5 million euros, falling from 155.1 million euros in 2006 to 38.6 million euros at December 31, 2007. The net financial position was negative by 185.4 million euros. The deterioration of 64.5 million euros, compared with a negative balance of 120.9 million euros at the end of 2006, is chiefly the result of a writedown of loans receivable amounting to 53.6 million euros. An analysis of the data by business segment shows that the manufacturing operations generated value of production of 536.1 million euros (19.5% more than in 2006), which is equal to 80% of total consolidated value of production (up from 76% the previous year). As a result of the developments explained above, EBIT attributable to this business segment were negative by 106.7 million euros (loss of 44.8 million euros in 2006). The service operations, which include design, industrial design and engineering, reported value of production of 134.3 million euros (140.3 million euros at December 31, 2006), equal to 20% of total consolidated value of production (compared with 24% the previous year). EBIT attributable to this business segment were positive by 3.3 million euros, more than double the 1.4 million euros earned in 2006. An improved performance by companies outside Italy accounts for most of this increase. EBITDA represent the profit or loss from operations before depreciation, amortization and additions to provisions. The result from operations is equal to EBIT before deducting extraordinary writedowns. EBIT represent the profit or loss from operations. To a very significant extent, the comments provided when reviewing the consolidated data are also applicable to those of Pininfarina S.p.A. Projections for the current year call for value of production to increase by about 10%, compared with 2007, and for EBITDA to grow strongly, rising to more than 5% of the value of production, due to the following factors: A sharp improvement in the performance of the manufacturing operations, thanks to the launch of new versions of the Alfa Spider and Ford Focus Coupé Cabriolet; Building on a trend that began in the second half of 2007, a further reduction in fixed and variable costs, which will be achieved by steadily raising efficiency levels and streamlining the manufacturing organization; The launch of service activities related to the development of an electric car. The result from operations is expected to show a significant improvement, even though it will remain negative. At the end of 2008, the net financial position should not be much different from the level reported in the preliminary year-end data due to the requirements of the financial plan. The Company launched a medium-and long-term Industrial and Financial Plan, which is consistent with the strategic guidelines approved by the Board of Directors on November 12, 2007. The objectives of new Industrial Plan will be to maximize opportunities in the electric car business, refocus the Group’s contract vehicle manufacturing services and expand its design and engineering services. The Company intends to be a leader in the market for electric vehicles, introducing by 2010 the first luxury city car under the Pininfarina brand, with zero emissions and zero fuel consumption. This project will thus be fully consistent with the approved guidelines, as they apply to strengthening manufacturing, leveraging knowhow and maximizing brand value. In developing its innovative electric car, Pininfarina will exploit both the outstanding competencies of the entire Pininfarina Group in the areas of design and product and process engineering and the knowhow and strong competitive advantage provided by the cutting edge technology developed by Bolloré, Pininfarina strategic partner, in the production of the Lithium Metal Polymer batteries that will be installed in the automobile, enabling it to deliver a better performance than competing vehicles. This new opportunity will allow the Company to approach more selectively the contract vehicle manufacturing business, with the specific goal of achieving lower risk and higher profitability than under its current contracts. The joint venture with Volvo will continue to be a strategic asset for the Group in this area. The Group’s Design and Engineering operations — which have grown steadily in recent years enabling Pininfarina to achieve a market share of more than 7% and rank among the top five European companies in this industry — will be a further source of growth: the Design organization, which recently won accolades at the Geneva Motor Show for its Sintesi concept car, will fully leverage its strong position in the luxury goods market to seize opportunities created by growing interest in “green tech design,” while the Engineering activities will focus on integrating the proven competencies of the Group’s organizations in Italy, France, Germany and Morocco. The main operating and financial objectives are: EBITDA margin higher than 7% by 2010; Breakeven result from operations in 2009; A ratio of net financial position to EBITDA of less than 1.0x by 2010. Comprehensive information about the industrial and financial plan will be provided to the market in April, after the publication of the Notice of Shareholders’ Meeting. The financial plan calls for an increase of the Company’s share capital amounting to about 100 million euros (counting both par value and additional paid-in capital) to be carried out this year through a rights offering for the shareholders of Pininfarina S.p.A., subject to the definition of a plant to reschedule/refinance the existing bank indebtedness, which is currently being negotiated. Companies controlled by the Pininfarina family will underwrite in full – or otherwise cause it to be underwritten — the pro rata share of the capital increase available to them through the rights offering. More specifically, the abovementioned companies could decide to sell a portion of their subscription rights to some investors who have expressed an interest in investing in the Company’s share capital and would agree to underwrite a portion of the capital increase. Vincent Bolloré has already indicated that he would be interested in such a transaction. With regard to the planned capital increase, the Company, working with Rothschild’s consulting support, believes that the rights offering, if approved by the Extraordinary Shareholders’ Meeting of Pininfarina S.p.A. (which the Board of Director will convene sometime before the end of April, when it meets again on March 27) and subject to securing the required authorizations, could be carried out before the end of the second quarter of 2008. Lastly, the Board of Directors was informed of the start of negotiations with important banks that could be retained for the purpose of establishing a placement guarantee consortium for the abovementioned capital increase.